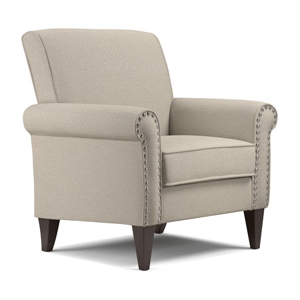 The Jean arm chair boasts a traditional roll arm design that will compliment a variety of home styles. Ariel Collection Contemporary Polyester Velvet Fabric Upholstered Button Tufted Silver Nailhead Accented Living Room Tuxedo Arm Chair with Clear Acrylic Legs. Create A Living Space That Welcomes And Relaxes. Wood Arms And Frame with Leather Seating. Strong Construction. Easy To Assemble.Size: 28InL. x 37-1/2In.W. x 36In.H..
Our Stool With Gentle Arch Forms And Padded Seat Make A Great Addition To Any Bedroom Vanity. Strong Construction. Easy To Assemble. Size: 32In.L. x 16In.W. x 24In.H..
An Intriguing Combination Of Dark And Light Banana Leaf Waved Around A Sturdy Wood Frame Making This Chair A Natural Standout In Any Environment. Strong Construction. Easy To Assemble. Size: 32In.L. x 30In.W. x 40-1/2In.H..
Armrest Chair. Easy To Assemble. Also Available (Not Included In The Price) End Table Size, 26 x 21 x 21H.. Enjoy Lounging In The Handsome Sea Grass Hand Woven Chair, Perfect For An Afternoon On The Veranda. Strong Construction. Size: 32In.L. x 26-3/4In.W. x 37In.H.. Solid Wood Occasional Chair. Strong Construction. Beautiful Fabric. Size: 32 In. x 31 In. x 43 In.(H). Round Tea Table With 2 French Arm Chairs. Details: Table Size: 15 Dia. Arm Chair Size: 37 H.
Cherry 3 Piece Set. Features Table and Two Arm Chairs. Strong Construction. Easy To Assemble. Details: Table Size: 15 x 24 H. Arm Chair Size: 23 x 37 H.
Beautifully Designed Hand Carved Occasional Chair Set In Cherry Finish. This Set Includes A Loveseat And Two Matching Arm Chairs With A Flower Seat And Back. Also Available (Sold Separately) Matching Cherry Finish Oval Coffee Table And Round End Table With White Marble Top. Strong Construction. Easy To Assemble.Dimensions:Loveseat: 49 In. (W)Arm Chair: 27 In. (W)Coffee Table: 43 In. x 25 In. x 18 In. (H)End Table: 23 In.(Dia.) x 23 In. (H)Can Be Sold As A Set Or Separately. Cherry Arm Chair With Tapestry. Features Floral Print. Strong solid wood Construction.Size: 24 W x 39.5 H.
Burgundy Chenile Wing Chair. Beautiful Design. Strong Construction. Size: 31 x 42 H.
Black Vinyl Wing Chair. Beautiful Design. Strong Construction. Size: 31 x 42 H.